Little can be more disheartening than filing your tax return and planning what you’re going to do with your refund only to get a notice from the Internal Revenue Service instead of a check. The notice says that you won’t be receiving that refund after all. This sometimes happens not because you’ve made an error on your return or claimed a deduction to which you weren’t entitled but because you filed a joint married return with your spouse and he owes money. Certain federally recognized creditors can legally intercept your federal tax refund. But what if that refund was half yours and the debt in question has nothing to do with you? The IRS provides a way for you to get your share of the money back. It’s called injured spouse relief. 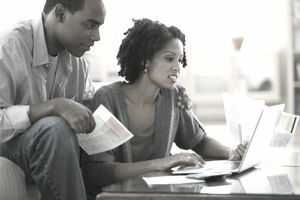 Injured spouse relief isn’t the same as innocent spouse relief, although both relate to jointly filed married tax returns. You’re “injured” when someone takes money that’s rightfully yours. You’re “innocent” when your spouse commits some wrongdoing on a joint return but you had no knowledge of what she was doing. You're considered an injured spouse when your share of a joint tax refund is used to offset a debt that's solely owed by your spouse. The average creditor can’t seize a tax refund, but government agencies can. Common debts that can result in this type of offset include federally-backed student loans, past due child support if the child is from another relationship, and federal and state tax debts due on separately filed returns in previous years. If your joint tax refund is intercepted to pay any of these debts, you have recourse. This is the Internal Revenue Code so of course there are rules. First, you cannot be legally liable for the debt in whole or in part. In most cases, but not all, this means the debt has premarital origins—your spouse incurred it before you married. He might have incurred student loans for his own benefit while you were married, however, or he might owe taxes on a separate married tax return. You must also have reported income on the joint tax return in question, although it doesn’t necessarily have to be earned income. Interest or profits from investments can meet this rule. The point is that you’re not entitled to a share of the refund if you didn’t contribute to the earnings reported on that tax return. Public assistance payments and Social Security benefits don’t count as earned income. You must have paid in something toward the taxes due on the tax return in question as well. This can be withholding from your paychecks or estimated quarterly payments you made because you’re self-employed. You can also meet this requirement if you qualify for a refundable tax credit which acts like a payment toward taxes owed. File IRS Form 8379 if you feel that you’re entitled to your share of a refund that was taken to pay your spouse’s debt. You can download the form from the IRS website and the instructions walk you through completing it step by step. Be sure to attach copies of all your 1099 forms and all W-2s—your own and your spouse’s as well. It’s not necessary for your spouse to sign the form. Only you must do so, but make sure you include her Social Security number. If the debt in question is so significant that you expect your refunds will be subject to offset for years to come, you must file a separate Form 8379 each year. You have two options for submitting Form 8379 to the IRS. You can attach it to your joint tax return when you file the return if you’ve already received a Notice of Offset from the U.S. Treasury Department's Bureau of the Fiscal Service. The notice will indicate that some or all of your potential refund will be seized when you file. Write “Injured Spouse” at the top of your tax return in the left corner of the first page. You can also include Form 8379 if you e-file your return. Your other option is to submit Form 8379 by itself if you’ve already filed your return. You have up to three years after the original joint tax return was due to do so, including any extensions you applied for in that tax year, or two years from the date you last paid any taxes due on the return, whichever is later. Some isolated exceptions apply to this rule so you might have a little more time. Check with a tax professional to be sure if you think you’ve missed the deadline. Do not include a copy of your filed tax return if you send in Form 8379 by itself. This will only slow things down. The IRS will review your submission and attached documents to determine whether you meet all the rules for injured spouse relief. Unfortunately, this won’t happen quickly. The IRS indicates that it will process your Form 8379 request and respond to it within about 14 weeks, although you might hear back within 11 weeks or so if you file electronically. If you file Form 8379 with your tax return, the IRS will process it before offsetting any funds for the debt in question. If your request is approved, you’ll receive a portion of the taxes you paid in personally on that return. The amount will correspond to the percentage of those payments that was represented in the seized refund. You should also receive a prorated share of any refundable tax credits you qualified for and claimed. You might be subject to special rules if you live in one of the community property states. These states take the position that debts incurred during a marriage are equally owed by both spouses and assets acquired during the marriage are equally owned by both spouses as well. This can obviously complicate things. The nine community property states are Arizona, California, New Mexico, Texas, Louisiana, Washington, Idaho, Nevada, and Wisconsin. If you live in one of these jurisdictions, speak with a tax professional to find out where you stand. Each state’s laws can differ and the IRS defers to state law in this situation.